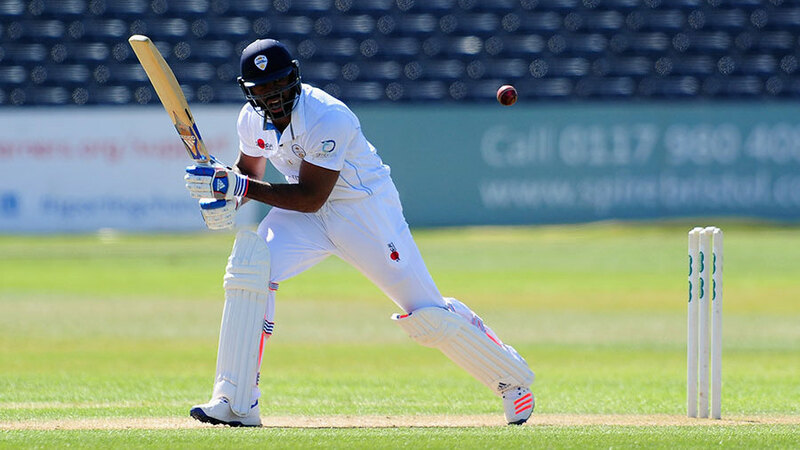 Chesney Hughes hit an unbeaten 137 as Derbyshire comfortably batted out for a draw on the final day of their match with Gloucestershire in Bristol. With Hamish Rutherford contributing 78 to a second-wicket stand of 174, the visitors wiped out Gloucestershire's first innings lead of 119 with few alarms under largely cloudless skies. Derbyshire had reached 260 for 2 when the players shook hands at 4.50pm, by which time Hughes, who had fallen four short of a hundred in the first innings, had faced 240 balls and hit 20 fours and a six without giving a chance. It was an impressive display by the powerful left-hander. Gloucestershire took 12 points and Derbyshire eight from a game dominated by the bat on a slow, benign wicket. The final day began with the hosts leading by 119 on first innings. Derbyshire's first task was to avoid losing early wickets, but Lady Luck soon took a hand. Ben Slater was unfortunate to be run out for 6 when seamer Liam Norwell, operating from the Pavilion End, tipped a straight drive from Hughes onto the stumps at the bowler's end. Gloucestershire were unable to capitalise on a surface offering little in terms of spin or seam movement and soon the draw was looking inevitable. By lunch Derbyshire were virtually safe on 105 for 1, with Hughes having moved to fifty off 75 balls, with 10 fours, and the less secure Rutherford on 37. The home side had to wait until the 55th over for a second success when Rutherford, who had escaped some airy shots, was caught by the diving Chris Dent at cover off Jack Taylor, having faced 142 balls and hit 10 fours. Rutherford had made an important contribution, while never looking in great form, and by the time he fell his side were 61 ahead. Hughes moved confidently to his eighth first-class century and second against Gloucestershire, bringing it up with his 16th four, forcing offspinner Taylor through the off side. He was unbeaten on 123 at tea, which was taken with Derbyshire 219 for 2, exactly 100 ahead. The shortened final session saw Hughes and Wayne Madsen (27 not out) bat effortlessly as Gloucestershire rested their main seamers. But there was a scare for the hosts near the end as skipper and wicketkeeper Gareth Roderick had to leave the field with a hand injury, sustained standing up to the medium-pace of Kieran Noema-Barnett. It was a match made memorable by the third-day century of Gloucestershire nightwatchman Norwell, but otherwise home supporters will be hoping for more entertaining cricket when Worcestershire provide the opposition on Sunday.